1. Samuel told them to all gather at Mispeh and he would pray for them (1Sa 7:5). 2. Having a godly man pray for you is advantageous (Job 42:8-10). 3. The effectual fervent prayer of a righteous man availeth much (Jam 5:16). 1. Israel humbled themselves, fasted, and confessed their sins to God (1Sa 7:6). 2. If we humble ourselves, God will lift us up (Jam 4:8-10; 1Pe 5:6). 3. Those who confess theirs sins and forsake them will find mercy (Pro 28:13). 4. God rewards sincere fasting (Mat 6:16-18). 1. When the Philistines heard that Israel had gathered together they went up against them and Israel was afraid (1Sa 7:7). 2. The devil will do anything to keep us from assembling with our brethren and repenting of and confessing our sins. 3. Although Israel was afraid, they didn't let their fear overcome their faith. 4. Israel asked Samuel to keep praying for them, that God would save them from the Philistines (1Sa 7:8). 1. Samuel offered a young lamb as a sacrifice and cried unto the LORD for Israel (1Sa 7:9). 2. Samuel sought God through the blood of a lamb, which is a picture of going to God for salvation through Jesus Christ (Heb 10:19; Heb 7:25), the lamb of God (Joh 1:29). 3. Whoso calleth upon the name of the Lord shall be saved (Rom 10:13; Psa 116:4,8; Psa 107:6,13,23-30). 1. While Samuel was making the offering, the LORD destroyed the Philistines before Israel (1Sa 7:10). A. God knows what we need before we ask (Mat 6:8). B. God answers before we call (Isa 65:24). 2. God loves 11th-hour-victories because it ensures that He gets all the glory. 3. God will not let us be tempted above that we are able, but will always leave a way of escape (1Co 10:13). 1. Israel then went out and smote the Philistines (1Sa 7:11). 2. Once God had done the hard work, Israel then did their part. 3. Once God first works in us to will and to do of His good pleasure by giving us eternal life, then we must work out that salvation temporally by doing the good works which He created us to do (Phi 2:12-13; Eph 2:10). 1. Samuel commemorates the victory by setting up a stone and calling it Ebenezer, which means The Stone of Help (1Sa 7:12). 2. 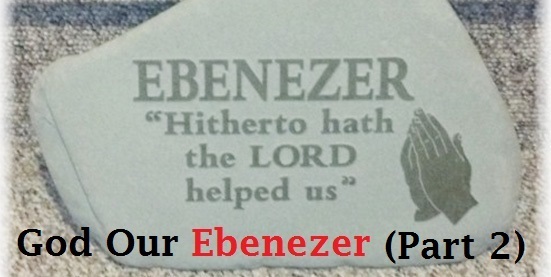 Jesus is our Ebenezer, the chief corner stone (Eph 2:20) which helps us (Heb 4:15-16). 1. As long as Samuel lived, the Philistines were subdued and gave Israel no more trouble (1Sa 7:13). 2. Having a godly person around will spare people trouble (Jer 5:1). 1. God gave back Israel the cities and the coasts which the Philistines had taken and gave them peace (1Sa 7:14). 2. When a man's (or a nation's) ways please the LORD, he maketh even his enemies to be at peace with him (Pro 16:7). 3. This happened to Israel under the reign of godly king Jehoshaphat (2Ch 17:3-6,10-11). 4. The work and effect of righteousness is peace and quietness (Isa 32:17-18). 1. Samuel spent the rest of his life in Israel as a judge and circuit riding preacher (1Sa 7:15-17). 2. 1Samuel 7 is a beautiful story of how God our Ebenezer will save His people from their enemies and their troubles and give them peace when they turn from their sins and idolatry and seek him with a humble heart.